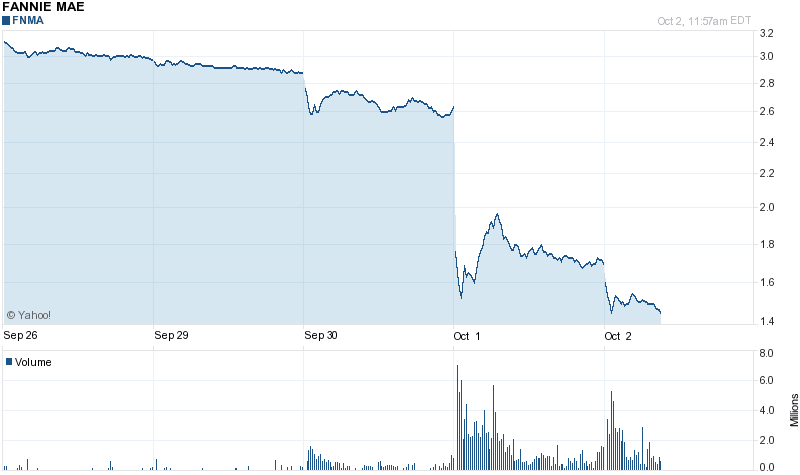 Yesterday Fannie Mae (FNMA) and Freddie Mac (FMCC) both got smacked down hard. As luck would have it, I got out last week after taking a minor loss. No clairvoyance on my part, but I did re-examine my reasons for getting into them, which was a perceived increase in new home construction. I didn't look at any government statistics, just seeing new homes starting to go up. This was back in May and the two stocks did double back them. But 5 months out I was seeing no upside bump or jump at all, so I pulled the sell trigger. Good thing I did. I'm still following them. At the new price I consider them both buying opportunities, but not yet, I want to wait a few days to see if they continue to drop (down about 10% today). Sure, a lot of it is that the markets have been down for 3 days, but at a time when everyone else has been getting a slap on the wrist, someone opened a can of WA of epic proportions. This is the price range they were at before the big spike so I don't think they'll fall too much more. But you never know. Sure they may spike up and I'll miss a great opportunity, but I can live with that. I'm still seeing lots of new construction, maybe the market hasn't caught up yet. Ten years ago these were both $60/share stocks. I can dream, can't I? One of the hardest things to decide when investing is when a stock has run it's course. What I mean is, you maybe bought a stock a few years ago and it's up 60-80% over that time, but in the past 2-3 months it hasn't really moved. It's plateaued. An example is Microsoft (which I don't own at the moment). Back in the 80s ands 90s this was a millionaire maker. But if you look at it over the past 10 years, it's pretty much stayed between $25-$35/share. During that time, if your goal was growth you didn't get much. 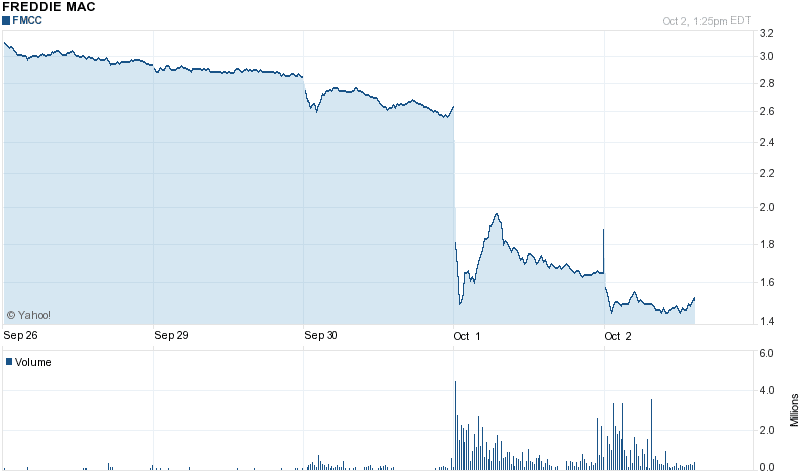 But if you were one of the lucky ones who bought when it was less than $10/share, you were sitting on a nice return. A very nice return. But you were sitting. In hindsight, you could have put that money to better use somewhere else. But it's scary to sell and miss any potential upside that might come (as it has in the last few months, moving over $40 for the first time in years). But hindsight is 20/40. The challenge is to recognize an extended stagnation period in a stock and move your money to other stocks with potential grown. You don't have to move it all, especially if you think there's a chance of a spurt. But I suggest you at least take your initial investment and some gain off the table, that way your playing with "house money" meaning, if it goes south you took some gain off the table, as well as your initial investment, so you really haven't lost. This is on my mind because I'm sitting on a few stocks with some ridiculous returns (in all fairness, I've had some since the 2007 crash). I've moved some, buying Fannie Mae (FNMA) and GT Advanced Technologies (GTAT) as I've mentioned in recent posts. Both are up as of today. But I have to do more. I have several stocks with 3 figure returns that aren't moving like they once did. I'm not necessarily going to cash out totally, but I need to diversify. I'm still seeing new housing going up on my way to work, and I still think there's about to be a housing boom (not bubble). Interest rates are still low, and the economy is picking up steam, regardless of what some would like you to think. So, gotta get out of the trap. No, not the lady, the company. Helen of Troy (HELE) is the company behind such brands as Honeywell, PUR, Braun, Vicks, Revlon, Brut & Dr. Scholl's, to name a few. In May it was below $35/share, today it's playing with $58, including a 10% gain yesterday on the news that they announced a CEO succession plan. Wow. Looking at the quarterly revenue, it tanked in May, but has been growing like crazy since them. This is one of those "power behind the throne" type companies, you don't know their name, but you know all their subsidiaries. In researching them, I came across this article where a product from Vicks is being used to map America's driest cities. Not the most exciting thing to hear, but that's music to an investor's ears. I don't expect them to double in the next 6 months, but that would be nice. Realistically, I'm thinking this is a long term buy & hold. As a side note, be sure to tune into tomorrow's Bunny Slippers Are Evil Jobseeker's podcast at 10:00AM. This week's discussion of money is joint effort between this blog and that one. Hard to love BlackBerry. Very hard. I'm thinking, I must be missing something. Big. Back in 2007 when they had 2 presidents and no clue, they refused to get rid of their physical keyboard and almost got wiped off the planet. Now that that ship has sailed, they're thinking that's what will get them back in the game. Really? Again, maybe I'm missing something, but I know personally my use of my phone is too varied to have to have a keyboard all the time. Too many games and apps don't require one and if it's there all the time, IN THE WAY, I don't see it setting the world on fire. The BB10 was a disaster. They need to back up, look at where the market is going, and then try to be there. What is it with companies who think they can walk into the cell phone/tablet space and unseat the 2 titans overnight? I mean, is there something in cell phones or tablet that people are begging for but not getting? I don't think so. And if they were, I doubt it would be physical keyboards.